If you are using pure JDBC and not using the high performance journal then you are generally relying on your database as your single point of failure and persistence engine. If you do not have really high performance requirements this approach can make a lot of sense as you have a single persistence engine to backup and manage etc. 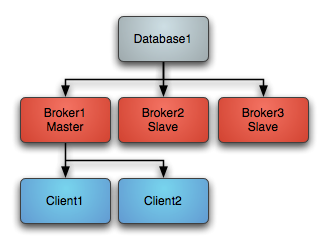 When using just JDBC as the data source you can use a Master Slave approach, running as many brokers as you wish as this diagram shows. 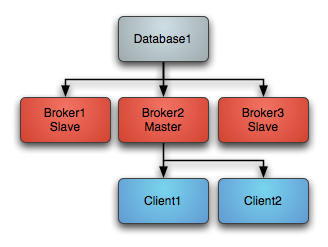 On startup one master grabs an exclusive lock in the broker database - all other brokers are slaves and pause waiting for the exclusive lock. Only the master broker starts up its transport connectors and so the clients can only connect to the master. One of the other other slaves immediately grabs the exclusive lock on the database to them commences becoming the master, starting all of its transport connectors. Clients loose connection to the stopped master and then the failover transport tries to connect to the available brokers - of which the only one available is the new master. By default if you use the to avoid the high performance journal you will be using JDBC Master Slave by default. 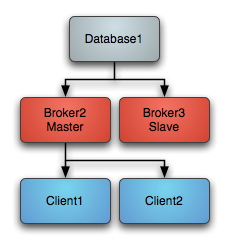 You just need to run more than one broker and point the client side URIs to them to get master/slave. This works because they both try an acquire an exclusive lock on a shared table in the database and only one will succeed.